This recipe begins with beef, potatoes and carrots in a slow cooker—and ends as a delicious BBQ-saucy stew that serves eight, deliciously. Place meat and vegetables in slow cooker; top with bay leaves. Mix broth, barbecue sauce, 1 Tbsp. soy sauce and crushed pepper until blended; pour over ingredients in slow cooker. Cover with lid. Cook on LOW 8 to 10 hours (or on HIGH 4 to 5 hours). 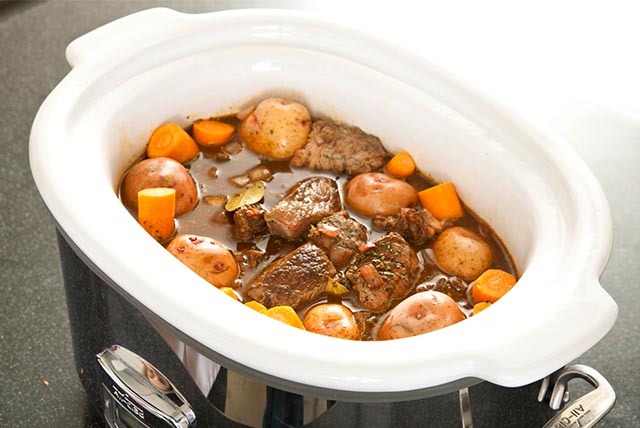 Use slotted spoon to transfer meat and vegetables from slow cooker to bowl; cover to keep warm. Pour liquid from slow cooker through strainer into medium saucepan; discard strained ingredients. Skim and discard any fat from surface of strained liquid. Return meat and vegetables to slow cooker. Bring liquid in saucepan to boil. Mix cornstarch and remaining soy sauce until blended. Add to ingredients in saucepan; whisk until blended. Cook and stir 2 min. or until slightly thickened. Add to ingredients in slow cooker; stir. Cover. Cook on HIGH 20 min. or until heated through.